Plans by three NHS primary care organisations to tighten restrictions on care and support spending for service-users with complex healthcare needs are a “huge concern” and could lead to disabled people being forced into institutions, say campaigners. The trio of clinical commissioning groups (CCGs) in Leicestershire have been consulting on plans that could see service-users receiving NHS continuing health care (NHS CHC) only being allowed to continue with support in their own homes if it is no more expensive than a place in a nursing home or other institution. 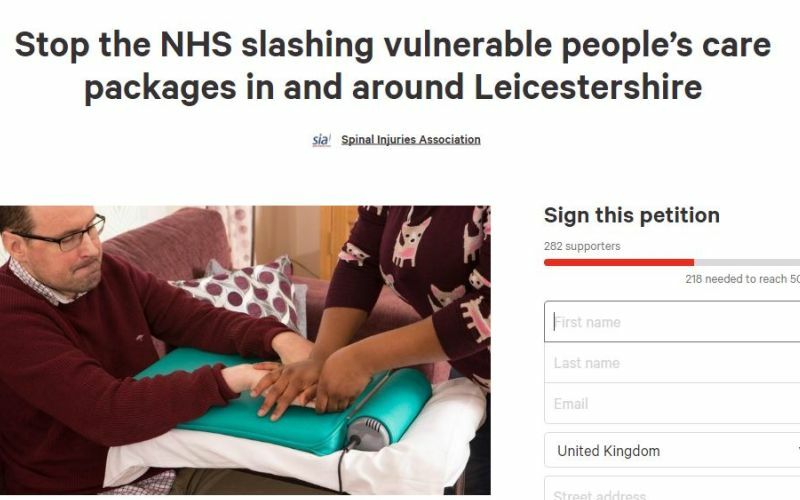 The user-led Spinal Injuries Association (SIA) has warned that such a “fundamentally unfair and cruel” policy proposal has made Leicestershire the “front line” in the campaign to oppose CCGs that want to use cost arguments to force service-users into institutions. SIA, which has launched a petition against the plans (pictured), warns that such a policy could mean “newly paralysed individuals never returning home from hospital and spending the rest of their lives in a nursing home”. In its response to the consultation, SIA warns the CCGs that their consultation is unlawful because of the lack of detailed information, while the “unacceptable” policy proposals “will clearly limit disabled people’s opportunities to live independently in Leicester, Leicestershire and Rutland by forcing them into residential care homes”. Dan Burden, SIA’s head of public affairs, said the proposals in Leicestershire were a “huge concern”. He added: “We are running the risk of rolling back 30 years of disability rights campaigning. Last month, research by disabled campaigner Fleur Perry, editor of the website Disability United, showed that at least 44 CCGs – and probably many more – would be willing to move disabled people with high-cost support packages into institutions against their wishes. Most of these CCGs were suggesting that they would not fund NHS CHC packages in a service-user’s own home if they were more than 10 per cent, 25 per cent or 40 per cent more expensive than a residential placement. In two cases, the CCG’s policy stated that it would not pay any more for a package of care in a person’s own home than they would spend on a care home place, unless in exceptional circumstances. Now East Leicestershire and Rutland CCG (ELRCCG), together with Leicester City CCG and West Leicestershire CCG, have been consulting on plans that could further tighten their existing policy on NHS CHC. Their current spending limit allows them to spend up to 25 per cent more than the most cost-effective option to provide care in a setting of the service-user’s own choice. 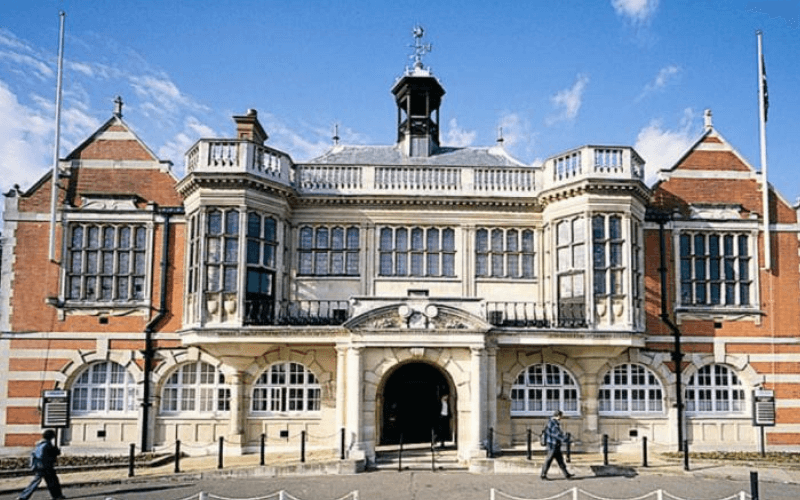 But their consultation offered those taking part in a survey which closed this week just two options for their future policy: spending no more than the cost of an equivalent care home placement, or spending only up to 10 per cent more on care at home. There was no option for those taking part in the survey to disagree with the two options. There are more than 1,300 people across Leicestershire and Rutland who receive NHS CHC, and the three CCGs claim that the current position on CHC spending “is not sustainable”. An earlier consultation by the CCGs found that all but one of 202 people who answered the question – nearly all of whom were service-users receiving NHS CHC, carers or relatives – said that the importance of healthcare being provided in a patient’s preferred setting was important, fairly important or very important. More than half agreed that there should be some kind of limit on how much extra funding can be spent to care for a service-user in their preferred setting. The Leicestershire CCGs claim their draft policy complies with their Equality Act duties as public bodies, and that it is “an attempt to balance the different interests (available resources vs meeting the desire for bespoke services at home or in an alternative setting)”. East Leicestershire and Rutland CCG had refused to comment by noon today (Thursday).